Laser Eyebrow Washing Machine Portable High-Power Wash Tattoo Freckle Moles Beauty Equipment mainly consists of optical path system, power supply system, computer control system, cooling system and so on. 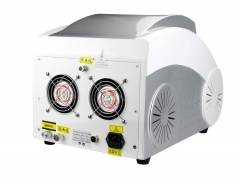 The optical path system is installed in the handle housing, and the power supply, control and cooling system are installed in the power supply case. The main function is to remove tattoo, such as colored eyebrow, eyeliner and lip line and so on. Operation mode: intermittent loading continuous operation mode, with 5000 pulses per continuous output. The interval is 10 minutes, and the "PULSE" of the screen is 005000. 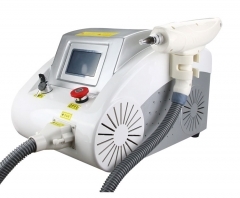 Laser Eyebrow Washing Machine Portable High-Power Wash Tattoo Freckle Moles Beauty Equipment adopts the Q-Switching of gem , and uses laser to transmit high energy instantly to effectively destroy the pigments of pathological tissues. 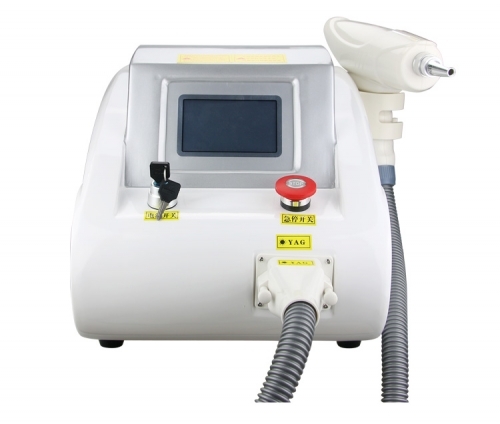 That is the principle of laser blasting: the laser gathered high energy instantaneously, so that the laser in the fixed wavelength penetrated the epidermis to the pathological tissue in a short time (only 6ns), and quickly shattered the corresponding pigment. A part (based on the tissue) is broken into tiny particles that can be made by macrophages in the human body. After being digested by macrophages, the pigment will eventually circulate through the lymphatic system in the body. The pigments of the tissue will gradually fade to disappear, and the skin tissue around it is not absorbed by the fixed wavelength. Light does not cause any damage. 1.Without bleeding, there is no need for anesthesia. 2.New blue LCD display, microcomputer automatic counting. 3.Installed with ruby machine core, and the machine core does not need replacement, and maintenance free for life-long. 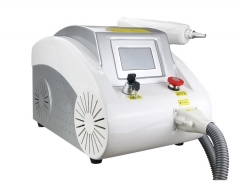 4.The energy of the light pulse is large enough to completely remove all kinds of pigments. 5.Dual wavelength setting, effectively dispel pigmentation 532nm and 1064nm. 6.New cooling system, air cooling + water cooling + built-in closed cycle air cooling, making a single working time longer. 7.Portable eyebrow washing tattoo machine is small and easy to handle. 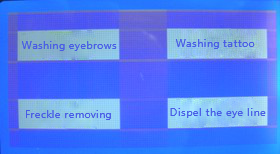 1.Effectively remove all kinds of tattoo eyebrows, embroidered eyebrows, tattoos, lines and lip lines. 2.Specifically remove red, blue, brown, brown and all kinds of color tattoos.